The Category Tabs module allows you to create tabs on category pages. Structure the important information about the category’s products - add texts, videos, widgets, FAQs so that your customers can easily find what they are looking for. Each category or sub-category can have its own set of tabs (even different design if you wish). Tabs are easy to create - you manage them directly on the category page. There is a visual editor (WYSIWYG) for the tabs’ content, so you can format the tabs’ text, insert pictures, video, links and so on. In addition, the editor allows inserting widgets, so depending on which ones you have on your website you can include contact form, files for downloading, product sliders, countdowns, different sets of products and so on. 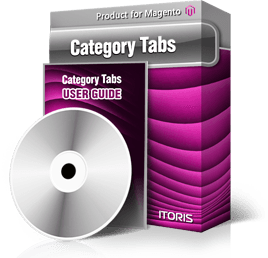 ITORIS provide lots of Magento widgets that are fully compatible with Category Tabs and provide widgets for the tabs. There are several effects for tabs to change each other available - select one you like most. Pre-created responsive design schemes (ideal for mobile and desktop templates) are for you to select how your tabs will look. You can set tabs to be visible for selected customer groups only, so the same page will contain different tabs depending on which group the customer belongs to.